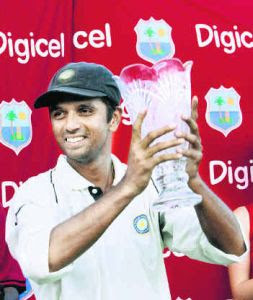 Rahul Dravid's decision to quit the captaincy certainly is a bolt from the blue. When such a proud and commited individual takes such a decision with the team is in a transition and knowing how much the team depends on hin, it must raise raise the question as to the circumstances which compelled him to take the decision. I suppose it was a combination of factors, starting with the world cup debacle. Chappell had to go after that but Rahul bravely soldiered on, reportedly on BCCI's request. You get the feeling he never got to impose his style on the team, something Ganguly did so famously. Part of the reason was because Chappell already had the team playing according to his theories. It is hardly a secret that Rahul is a player who thinks about each aspect of his game meticulously so in making him the captain Indian Cricket had an oppurtunity to have a captain who went with more than just his instinct. Most of Ganguly's successes as a leader, I thought were more to do with his man management skills than his ability as a strategist on the field. Dravid was never going to go that way. Nor was he ever going to get under the skin of a Steve Waugh. He knows only one way of playing the game and that is the good old fashioned slog. That he expected others in the team to do the same is a mistake which even Sachin Tendulkar was guilty of commiting. I suppose you need a certain detachment with the whole thing if you are an Indian captain. Azhar famously never gave much of an advise to the players on the field with the simple logic that they were international players and were supposed to know that already. Ganguly of course was the complete opposite, and he also got whatever he wanted out of the board. He knew how to get around the rules, so to say. But he never took matters personally, he only took so much responsibility which he felt he owned whereas Dravid and Sachin took it upon themselves to do everything. There were too many stories after the world cup on the differences between Tendulkar, Ganguly and Dravid and you just get the feeling that not all of it was untrue. I think Dravid was hurt somewhere at that time but carried on for another full series since there was no one else to lead. That there were no tamashas and fighting in the public (which the Pakistani players are prone to) shows the quality of all three individuals. That they chose to play together to try and win a test series abroad shows their commitment to the cause. Now that he has actually won the series in England, it is hard to understand the logic behind stepping down. I guess he is just fed up with all the unwanted attention the job brings. He certainly deserved better from everyone as the captain: the team, the board, the media and most of all the Indian public who made a monster of him for not winning the series in England 2-0 conveniently forgetting that we had never won over there for two decades. Now for the bigger Q: who next? Sourav would be a backward step, Sachin would be two steps back, and there is no room to go ahead. Yuvraj does not have a place in tests, Dhoni is already juggling batting and keeping. With the expectation on his batting only going up, to saddle him with captaincy would certainly kill his natural game, of which, he has shown glimpses already. Now, if Indian captaincy is such a huge burden, the selectors would be better off distributing it to two people. The only other person apart from the trioka who has a test place and leadership experience is VVS Laxman. He did show glimpses of coming back to his best recently and what better way to give him the captaincy: before a series in Australia! The ODI captaincy is a tougher one. If the selectors are not averse to having too much on Dhoni's plate he looks the best candidate, albeit the threat to his game. Else it must go to Yuvraj. But the mind keeps coming back to Dravid. The BCCI must ask him to continue for sometime, atleast till the end of the Aussie tour. We need a good captain as well as Rahul the batsman against Australia and there is no reason they cannot be bundled in one individual. I have been an avid admirer of Dravid's game for a long time now. However, when it comes to captaincy, I did better go with what u have quoted of Azhar. When everyone knew the game very well, the captain needs to know players very well, not just the game. And that trick, I guess is what Ganguly was good at. May be the BCCI should pick an other trick. Certainly not Dhoni. Anyways, nice to see your blog. I did love to hear cric from the guru than from anyone else n thats for sure u. wish u score a lot on this blog. good luck !